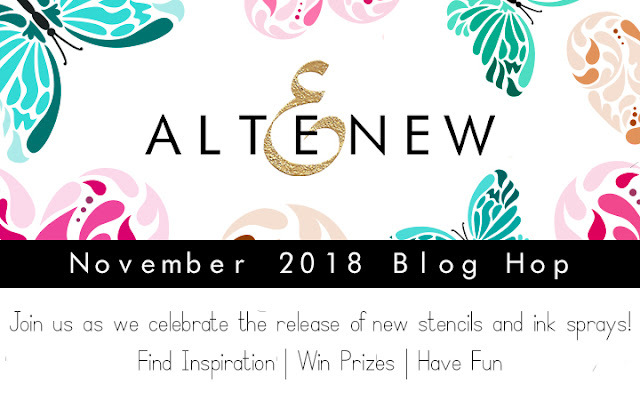 Welcome to Altnew Stencil/Ink Spray Release Blog Hop! I am super excited to share 4 stenciled/ink-sprayed projects with you. If you arrive from the blog of Kathleen Graumüller, you are in the right place! First up, it is this gorgeous Flowing Butterfly Stencil. It comes with TWO butterflies....how cool is that. I couldn't decide which butterfly to use and decided to use BOTH! The large butterfly was ink-sprayed with the new Cosmic Berry and Puffy Heart. For the small butterfly, I mixed White Embossing Paste with the ink spray and applied over the stencil. I used Gold Glitter Washi Tape and sequins to glam it up. The sentiment "hello beautiful" is from Inked Rose Stamp Set. My next card features the very cool Feathered Leaves Stencil . First I sprayed the Mountain Mist Spray onto Bristol paper, I then took the stencil and dabbed it on another piece of card stock. And that became the background for this card. The Potted Plants were stamped, colored and inked with Watercolor Brush Makers. The sentiment comes from Zinnia Build-a-Flower. My 3rd card features the Flowing Heart Stencil. I mixed the white embossing paste with the new Puffy Heart. The Dotted Washi Tape really comes in handy. 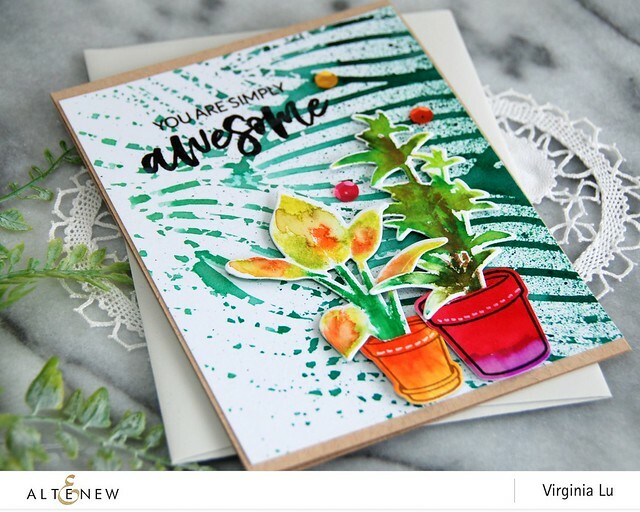 The beautiful sentiment comes from Garden Silhouette Stamp Set. My last card (alas, you made it) features the Sunburst Stencil. I used two ink colors to create a fun background. By rotating the stencil each time, you get to create this fun and colorful background. I used one of my all-time favorite stamp set with Floral Art. The flowers were colored with Watercolor Pan Set. The sentiment also comes from Garden Silhouette Stamp Set. Hope you enjoying seeing how these awesome stencils are used and applied. Prizes: to celebrate this release, Altenew is giving away a $50 gift certificate to 6 lucky winners. Please leave a comment on the Altenew Card Blog and/or Altenew Scrapbook Blog by Monday, Dec. 3rd for a chance to win! 6 winners will be announced on Altenew blogs on Dec. 7th, 2018. 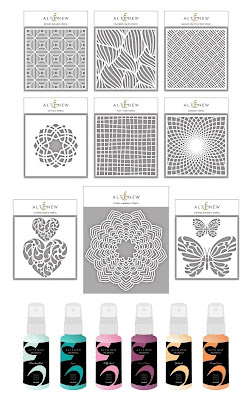 Giveaway: please leave me a comment (and tell me your favorite project/stencil/ink spray) in this very post for chance to win a Altenew $30 Gift certificate. The winner will be announced on Dec. 1st right here in this blog. Your next stop is the talented Vicki Boutin's blog. Below is the summary of today's post. Thanks for stopping by! I love your stencil on Washi tape. Love the idea! JUST WOW! I love them all but that butterfly is just STUNNING! What a cool idea and technique! I'm loving how you layered the butterflies on top of each other. Looks aweome! All of your cards are beautiful, and the new ink colors are too! GORGEOUS cards, I LOVE your heavy photo posts! These are all so lovely but my favorite is the butterfly card, love the glamorous and elegant look! Love your cards, specially the butterfly is awesome. Awesome inspiration! I love all the cards. My favourite products from this fabulous release are the Floral Mandala stencil and the Cosmic Berry spray. I also love the way you have used the Sunburst stencil. The technique is great. Can't wait to try it. Amazing use of color!!! I really love how the gold border on the first butterfly card. I’m gaga for gold!! Beautiful cards! Love all the new products! They're all so lovely, but the starburst stencil card is my favorite. The coloring is spectacular. The stencils are marvelous! You sure teamed your stencils up well! I am partial to the 'skylight stencil'. This hop is right up my alley.... I need some ideas and inspiration on using stencils! Beautiful cards! My favorite is the butterfly design! Such a great use of these products. New, fresh ideas. WOW! Awesome cards! I love your vibrant color choices. Already ordered the majority of stencils. Your projects are all quite lovely!! My favorite stencil is Feathered Leaves. 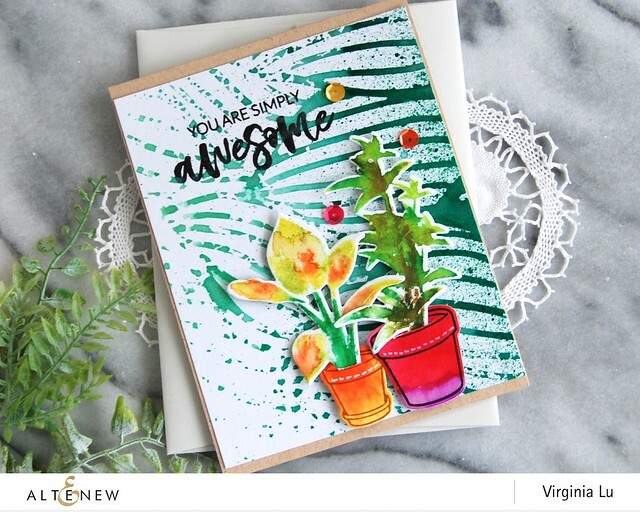 I absolutely love the card you created using that, along with the Potted Plants stamp set. These cards are quite lovely. Thank you for sharing with us. Beautiful cards, Virginia. Thanks for the chance. I love these wonderful cards, thanks for the ideas! 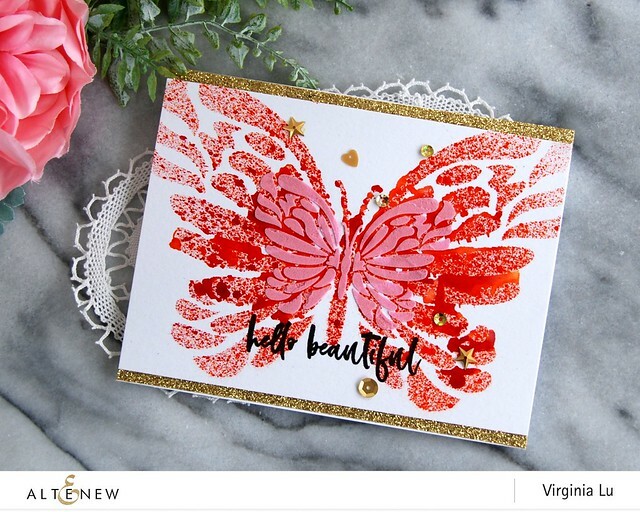 Love, love, love the butterfly card and that stencil! Wonderful cards! Great techniques with the new stencils and love all the bright colors. That leaf stencil is perfect for those potted plants! Great job. i love that feathered leaf background you made! whoa! what an amazing and simply stunning collection of cards! wow~! And thank you for all the photos too! nicely done! I really like how you layered the butterflies and used different techniques on them. And the flowing heart card is so pretty! Your cards are just beautiful. I love all of them but the butterfly is stunning. Thanks for sharing. I love your work. Thanks for sharing it with us. Love what you did on the butterfly stencil. Very pretty. 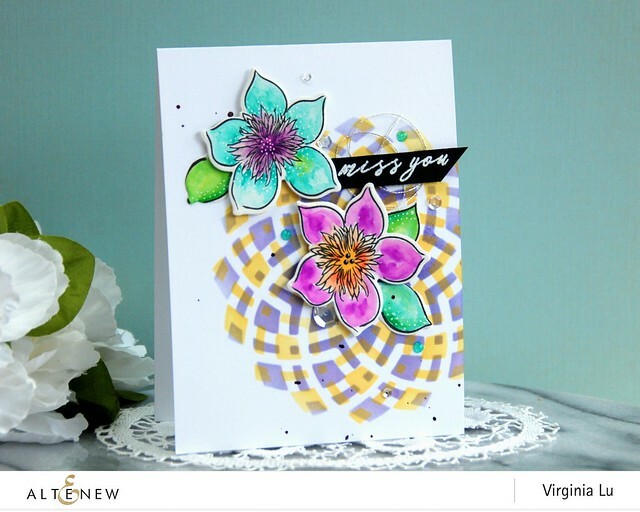 The starburst stencil is so pretty done in two colors, Virginia! Love that card. 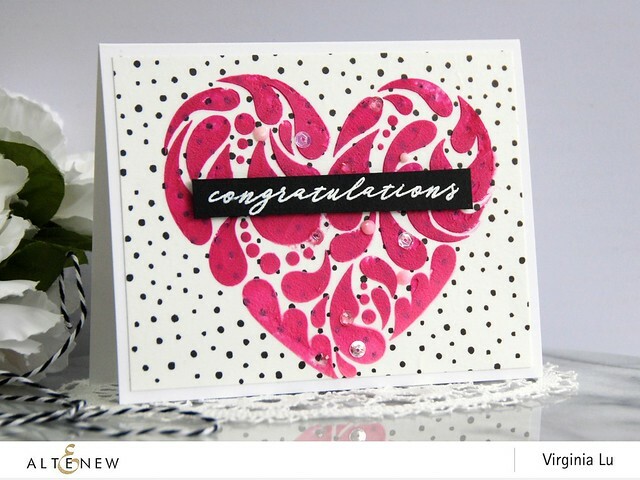 The gorgeous cards are wonderfully textured with visual flow from stencils, stamping and color. Fun cards! The last is my favorite...I love the way that stencil looks when you rotate it and use it again! Very creative! pots of flowers are darling. I loved your cards, and now I really am inspired to use washi tape as an integral part of my cards! Thank you for sharing your techniques with us. Love all of your cards, especially the butterfly and heart. The layered butterflies look amazing! Also love the redfish heart on the washi tape. Liked your card video. Gorgeous cards! Love the way you used the stencils and the amazing colors. All of your cards are just beautiful !! Simple techniques used so perfectly !! Your cards are gorgeous. Thanks for providing many examples using the new Altenew stencils and spray inks. The sunburst stencil is one of my favorites in this release and the way you used it was stunning. Thanks for the inspiration. I love how you have used all these stencils. Beautiful cards! Incredible Virginia. All your stencilled cards are simply amazing. Gorgeous cards using the new ink sprays and stencils with already existing products (washi and glitter tapes). Thanks for sharing. Awesome cards using these stencils. My favorite stencil is the Feathered Leaves. I just LOVE the butterfly card! I love the way you used both! The colors are awesome and the hint of sparkle is perfect! My favorite is that leafy stencil card, though! (I kill plants, but I adore plants and leaf stamps!) WOW! Your card is amazing! Great cards. Love the flowers. 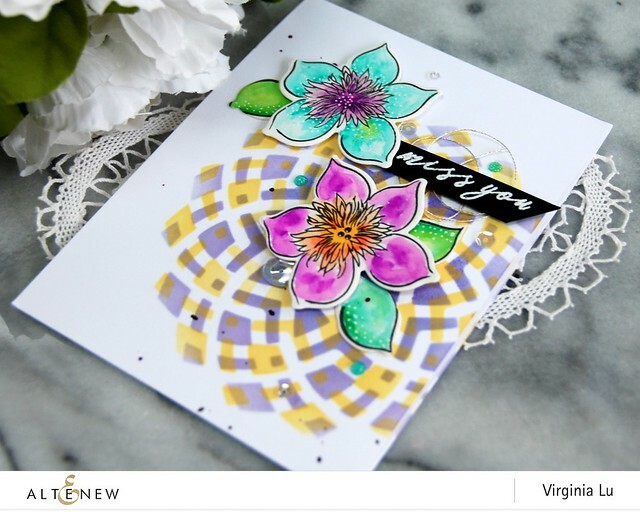 Love your card ideas and layering of color and stencils. Each card is unique and beautifully different! Love the warm tropical look of the card using Feathered Leaves stencil. WoW! These are all so beautiful! I can't even begin to choose a favourite. You've done it again Altenew. And these cards are simply beautiful! I love all these new stencils and your cards are just beautiful! If I had to choose just one, it would be the Feathered Leaves stencil. Beautiful cards ideas!!! Thank you for sharing!!! Wonderful cards. I like the contemporary twist you gave them with the stencilled backgrounds. 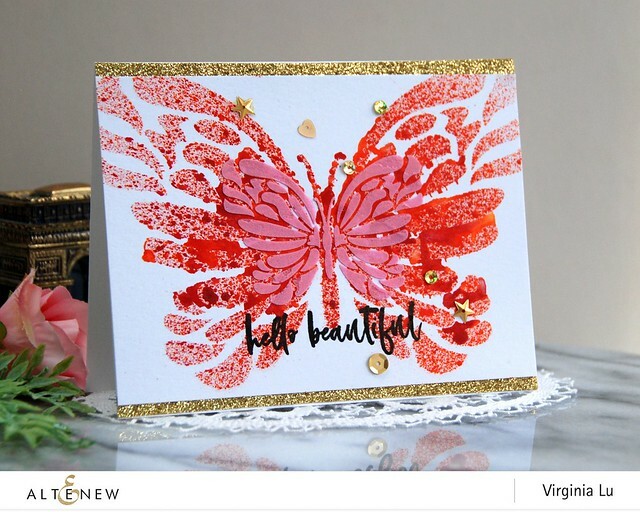 Using both butterflies to layer your design creates a stunning card! Love how you used the stencils in your designs. The double butterfly card is my favorite. Love the cards and the inspiration. That butterfly is stunning and I love the heart flourishes stenciled over the other pattern - lovely way to add more dimension! I really like all your cards - my favourite is the butterfly one. I love how you layered the 2 stencils! Oh wow, all are stunning, especially the butterfly. Love how you used both butterflies one on top of other. What a great idea to rotate the floral mandala! All of your cards are just so gorgeous. But that first card is just stunning! I love the layered look and the colors are just so beautiful! Your cards are simply stunning!! I find it hard to pick a favorite. You are blessed with creativity. My favorite stencil is the heart or maybe the feathered leaves. I love all the sprays, they are all so beautiful. You are so very talented! I love all your cards. The way you use stencils is inspiring. I esp. like the butterfly card. It is impressive. Your cards are gorgeous and that butterfly card is stunning! Beautiful cards! I love your butterfly! Awesome projects!! They are so bright and vibrant! I definitely enjoyed your cards. They are all wonderful! I love how you layered the butterflies and used different mediums on them. I love that feathered leaves background and your heart looks great against the dotted tape. Great cards! 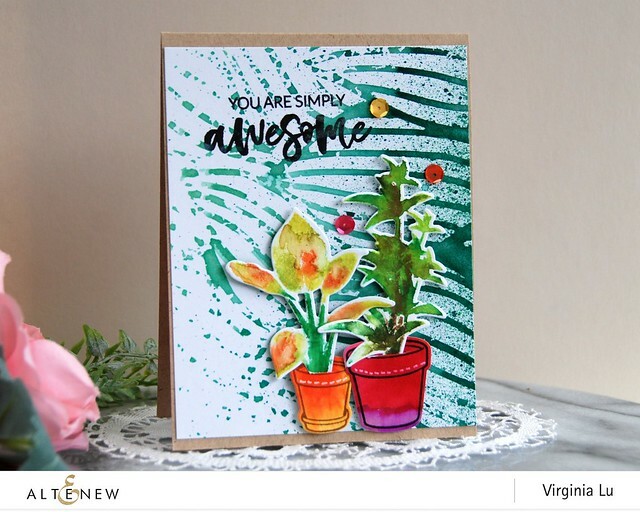 I am loving these new stencils, and especially love how you used them on that last card! Amazing cards Virginia. You surely showcased the stencils and sprays. So pretty. I love the stencil on the washi tape, very creative. I tend to really be drawn to the stencils that come to a central point in the middle, so I'm a big fan of the floral mandala and sunburst and starburst stencils. I just find them so helpful for drawing the eye to my focal point and making for a quick, interesting background. Thanks for sharing all these great ideas! 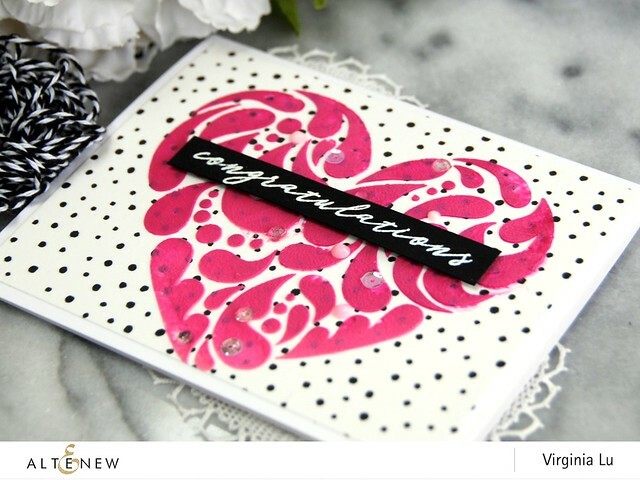 Love your cards and how you used the stencils. 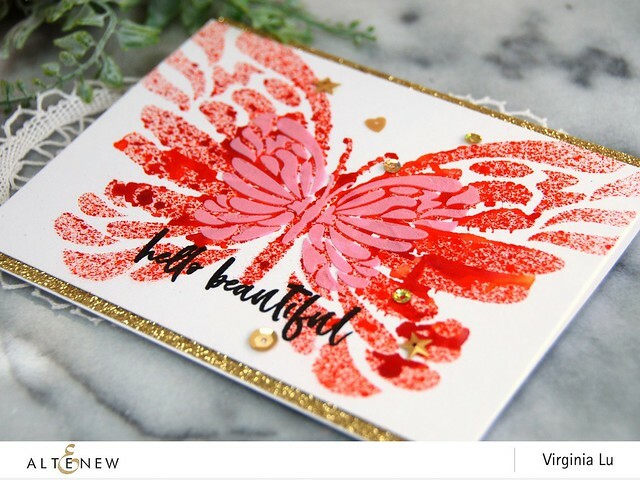 Your cards highlight these stencils so well! I am new to crafting and art my best friend has brought out the creative side in me. I really do like the Puffy Heart, I am wanting to get one desperately. By the way Merry Christmas. I seem to be doing this hop in wrong order & was wondering if I had missed you, glad I haven't. Loving these, so well designed, my favourite must be the beautiful puffy heart card, thank God. Beautiful projects. I love these new stencils and the ink spray colors are gorgeous. These stencils are so lovely, both as a backdrop and as the focus of a card. Love the Feathered Leaves with the Potted Plants. Thanks for sharing this inspiration with these fun products.